I have really enjoyed the new broadcasting technology that ESPN has introduced in the past season of soccer coverage, especially the "Axis" camera angles in the Euro 2008 games. I wondered how they did it, so I looked around a bit and here's what I found. The technology is made by a Swiss company, LiberoVision. “ESPN Axis” creates "virtual" replays using video captured by cameras covering the live action event. Images fed from the game cameras are calibrated and seamed together to create virtual freeze-frames from multiple angles. The angles of view may be tilted upwards by 90 degrees -- from pitch level to direct overhead shots -- creating three-dimensional, birds-eye views of key plays from multiple vantage points. ESPN ties together two camera feeds from different sides of the stadium to allow for analysts to swing around 90 degrees and show the backside of a play or overhead for a bird’s eye view. It takes approximately 10 minutes to process the video and build the graphics however Liberovision is working hard to shorten the time to air. “The minimum number of cameras you need is two,” says Stephan Würmlin, LiberoVision co-founder, adding that more cameras will require more processing time but will add more replay angles. The camera streams are ingested into an EVS server and then fed to the LiberoVision system that is 5 rack-units high. ESPN is using two software products, DiscoverEye, which builds the virtual graphics, and Interactive Telestrator, providing the ability to place 3D telestrator graphics that change perspective as the replay is played out to viewers. “It gives us five camera angles even though only two camera angles are being used,” says Toms. Axis really is a cool technology, like bringing a video game replay to the real world. It's unreal to me that no additional infrastructure is needed in the stadium to pull this off. I assumed there were about 100 cameras all over the stadium to do the effect but those smart Swiss have made it much simpler. Hopefully future coverage of Champion's League and MLS will receieve the Axis treatment. Here is an example of Axis from the "was he offside?" Netherlands goal vs. Italy in the Euro group stages. 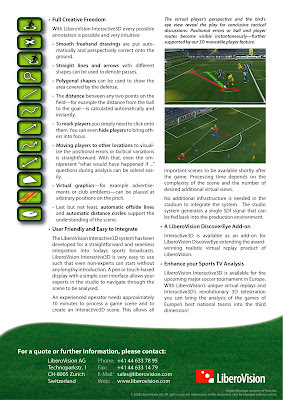 Check out the LiberoVision website for videos and more information on the technology.